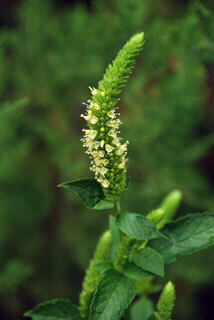 Also Called: Giant hyssop, yellow giant hyssop. Stems: Erect, stout, 4-sided (square in cross-section), glabrous, branching above; branches rigidly ascending. Leaves: Opposite, simple, thin, broadly egg-shaped, infrequently lanceolate, 1 to 6.5 inches long, .5 to 3.6 inches wide, reduced upwards, stem leaves often larger than branch leaves; upper surface glabrous, lower surface minutely-hairy to nearly glabrous; margins coarsely-toothed; tip pointed to tapering pointed; base rounded to somewhat heart-shaped; long-stalked below to short-stalked above; stalk .8 to 3.2 inches long, sparsely pubescent. Inflorescences: Spikes dense, continuous, cylindrical, 1.6 to 8 inches long, .4 to .8 inch in diameter, terminal; spike composed of false whorls of opposite cymes; bracts elliptic-ovate, usually exceeding calyx, sparsely pubescent, tip tapering-pointed. Flowers: Calyx tubular, usually 15-veined, 5-toothed, greenish, glabrous; tube 1/8 to 1/5 inch long; teeth ovate or broadly triangular, tips blunt or pointed; corolla 1/5 to 1/4 inch long, white, greenish-white, or pale yellow, conspicuously 2-lipped; upper lip shallowly 2-lobed, erect; lower lip 3-lobed, spreading, curved downward; stamens 4, arranged in 2 pairs, extending beyond corolla. Fruits: Nutlets, elliptic, about 1/16 inch long, brown, smooth, minutely hairy at tip. Habitat: Moist woodlands, borders of woods, rocky wooded hillsides, occasionally moist, open sites; alluvial soils. Distribution: Principally east half, but a few records in southwest 1/4. Uses: The Iroquois used a compound infusion of this plant as a wash to treat poison ivy. Comments: Greek agastachys, "rich in grain", perhaps alluding to the spikes resembling ears of grain.